Trailer Boat Refit Specialists We specialise in the refurbishment of trailer boat and power boat trimming and upholstery. Why outlay all that money on a new boat, when you can tidy up the current boat you have for a fraction of the price! If your current boat has been set up over the years to be exactly how you like it, why change? You will be amazed the difference some new upholstery and a cut and polish will make! Check out our Facebook page: https://www.facebook.com/WhangaparaoaAutoMarineUpholstery/ Boat upholstery and trimming refurbishment services include: ◦Hull linings ◦Cabin linings ◦Frontrunner ◦Seat recovering ◦Squab reupholstering ◦Side panel covers ◦Cockpit carpet and lining Boat covers and canopy refurbishment include: ◦Bimini top covers ◦Canopy backdrops ◦Road covers ◦Storage covers ◦Canopy side covers and clears Benefits of refurbishing trailer boats: ◦Much cheaper than replacing your boat ◦Get the colours exactly how you want them ◦Keep your tried and tested current fishing machine ◦Set up your boat's canopies how you want them Points of Difference: 26 plus years' experience in trimming and upholstery Over 15 years perfecting and developing marine upholstery systems The highest attention to detail - only the best will do! ◦One of the true fully qualified tradesmen ◦Specialising in trailer boat and marine upholstery ◦Only use the highest quality marine canvas available ◦We stand behind our work - we mean that! Check out our guaranty below ◦Deal with the tradesman that will actually be working on your boat Do we stand behind our work? ◦We believe we offer the best warranty around. In fact, we are so confident in our work, if you're not happy - you don't pay! ◦We only use the highest quality marine canvas for our boat covers. Our material comes with a 3 - 5 year U.V warranty. ◦We guarantee our workmanship for the life of the material! That's right, if there are any problems with our product, bring it back and we will fix it. ◦We believe in over delivering - you get what you expect plus more! Very Easy Boat Access Only 4 traffic lights & 25 minutes from the Harbour Bridge, the beautiful Whangaparaoa Peninsula offers lots of reasons to visit. Bring the family, have a day out while you call in or drop the boat off. We have strategically chosen our location for easy access when dropping off and picking up your boat. We can be available on weekends or after hours for drop off and pick up. Our goal is to make your experience with us an enjoyable one. We know you will be happy with our work, so we aim to make the transaction as easy as possible for you. Please don't hesitate to contact us with any questions you might have. 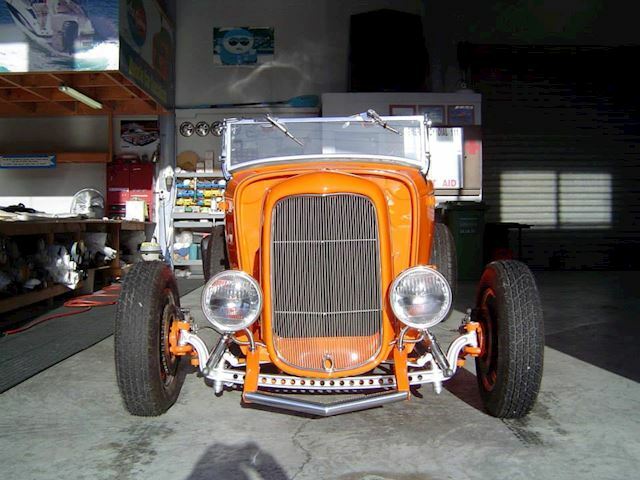 With a passion for muscle cars and a gift for restoring classic cars, Whangaparaoa Auto & Marine Upholstery, if you're in Auckland and in particular the North Shore or Whangaparaoa, is the only shop you should trust with your pride and joy! Tim has been approached by a number of hot-rod and muscle car magazines to show case his restoration on his classic 1971 GT Ford. Being the modest guy he is, Tim declined. We specialise in: ◦Classic car restoration ◦Muscle car restoration ◦Hood lining replacement ◦Auto seat recovering ◦Seat reupholstering ◦Customising car interior Boat Covers: Road covers, bimini top, marine canopies, side clears, backdrops, fly bridge covers, cockpit covers - specialising in trailer boats - We get it right first time every time! Marine Trimming: Trailer boat refitting and reupholstering is very popular, why replace your boat when all it might need is some new upholstery or squabs? Talk to us about refitting your boat first!